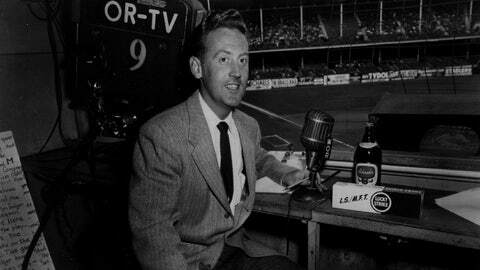 Vincent Edward Scully has seen it all in his 67 seasons at the microphone for the Brooklyn/Los Angeles Dodgers. The living baseball legend called Sandy Koufax’s perfect game against the Cubs in 1965, Hank Aaron’s 715th home run in 1974, the hobbled Kirk Gibson’s epic World Series Game 1 walkoff homer in 1988 ("In a year that has been so improbable, the impossible has happened") and many more classic baseball moments. But part of what makes Scully such a treasure, and so skilled, is his ability to seamlessly weave in other subjects into broadcasts — like world history and colorful, off-the-field anecdotes about players. He entertains and educates and calls a ballgame all the while. And with that, here’s 18 of Scully’s "bonus tracks." "Matt Williams' mom was a sheriff's deputy who helped apprehend Charles Manson." That's peak-Vin Scully right there. Always has the stories.